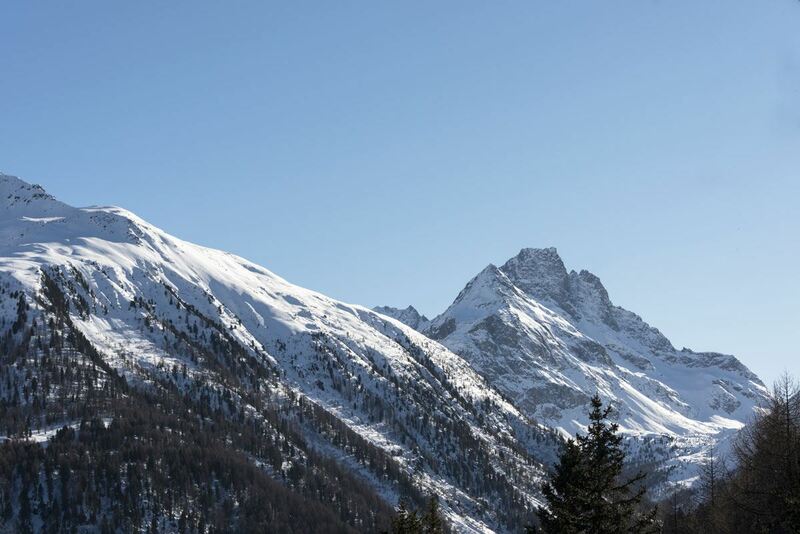 This is the third and last part of our adventures in the Lombardy Alps! 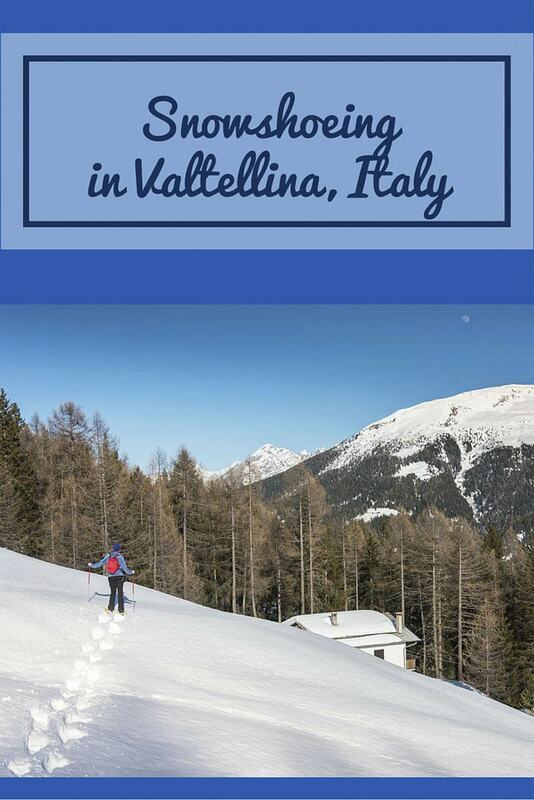 A day spent dog sledding and snowshoeing in lovely Valdidentro in the Sondrio province of Lombardia, very close to the Swiss border! We drove higher and higher, under a sapphire sky. I spent all my time dozing in and out, in that sweet spot where dreams and reality intertwine. 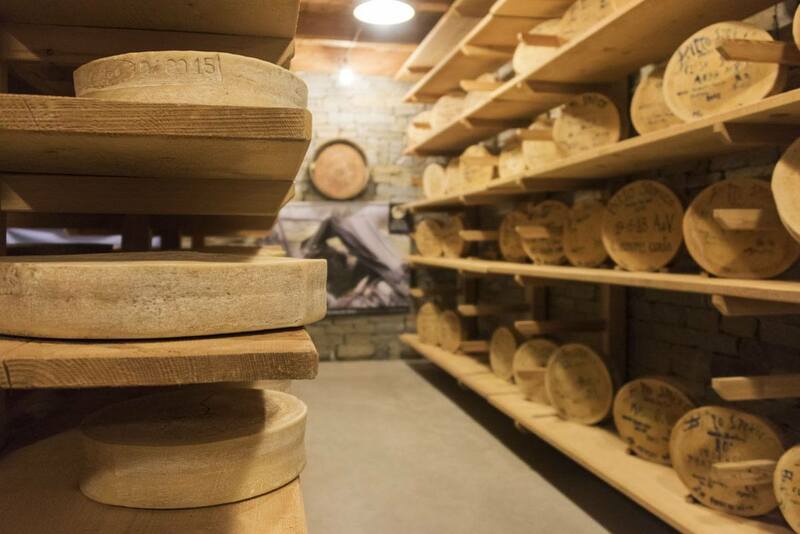 The previous day had taken a toll on me – an afternoon in Chiavenna visiting mansions and eating in caves, and an evening spent learning about Bitto cheese and hiking under the moonlight. Our destination was Arnoga, a mountain village in Valdidentro, one of the remotest corners of Valtellina, in the Lombardy Alps. Winter was slowly giving way to spring. The sun shone bright in a perfect sky, without the single blemish of a cloud. The trees had lost their snowy cover and stood – straight, bare, leafless – huddled against one another, as if they were guarding the mountain peaks from all that lay below. Oh, those mountains. The winter snows hadn’t melted – they never do, up there, over 3000 meters above sea level, where the air is thin and crisp and the colours are so much brighter. Peaks of rock and ice – covered with blankets of snow and glaciers, or streaked with rills and moraines, resembling fine ancient lacework. Yet, the snow had lost the powdery fluffiness of winter – it was heavy, icy, laden with water. Mojito-snow, I call it. Heavy on the knees when you’re skiing, heavy on the boots when you’re hiking. But skiing was not on the cards for that day. We were going dog sledding. 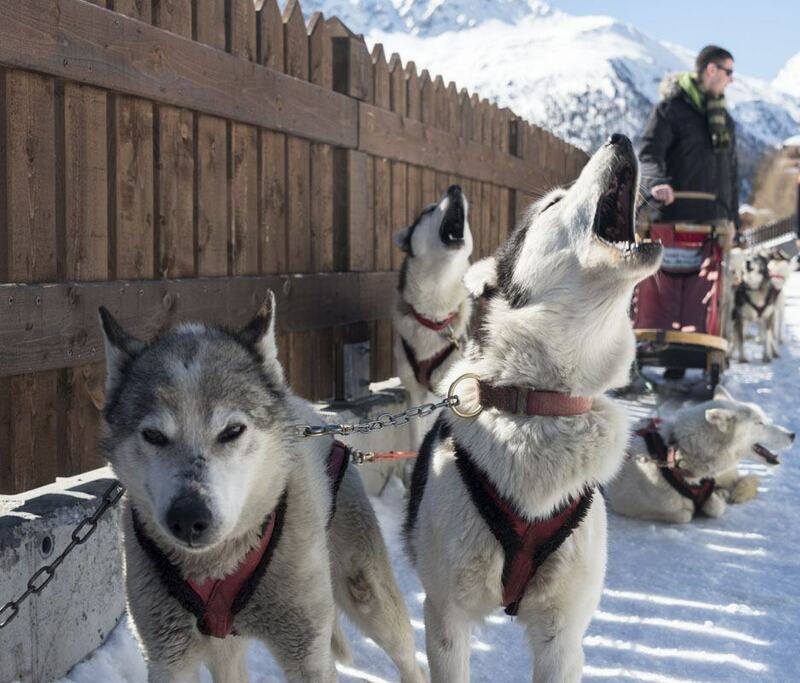 Arnoga is the home of Husky Village, one of the first and most famous dogsledding centres in the Alps. 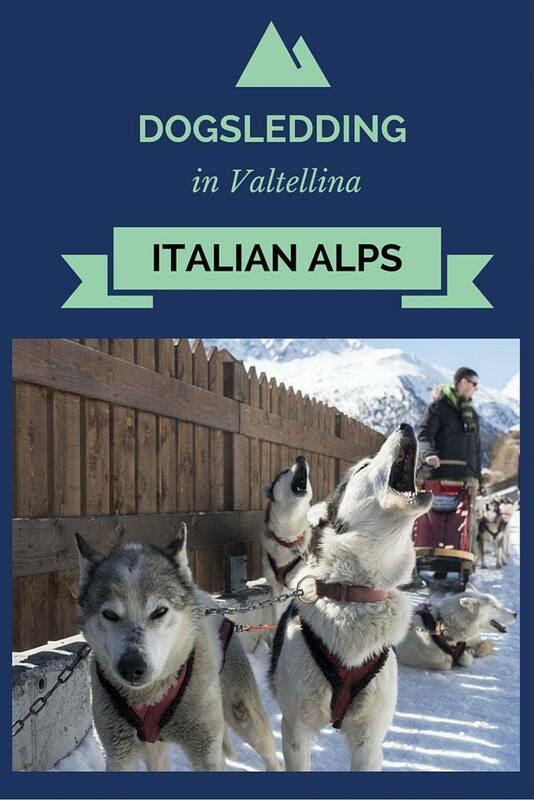 Lorenzo, the owner, told us of how his passion for huskies and dogsledding began. In the 1980s, huskies and other Arctic dog breeds became fashionable, and Lorenzo – who was working as a dentist technician in Milan, at the time – fell in love with them. 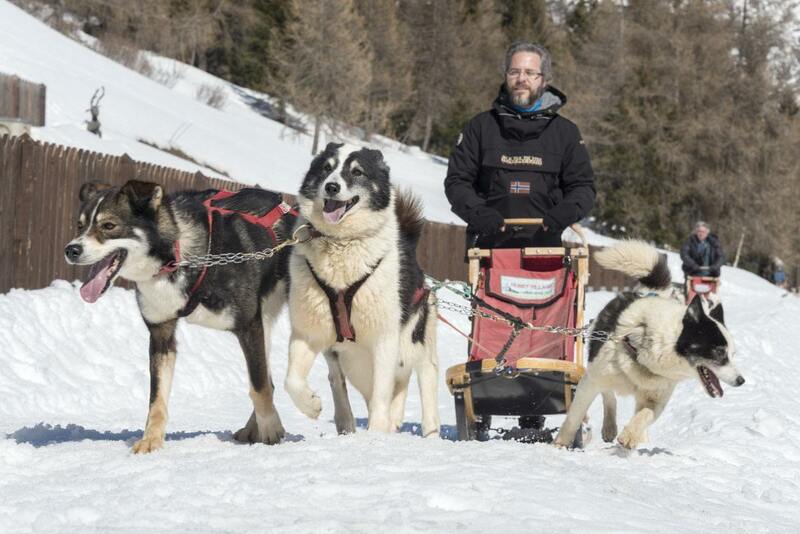 Most people would have been happy buying a Husky puppy, but Lorenzo’s passion ran deeper, and one day he left his job and boarded a plane bound to Alaska, chasing his dream of becoming a musher. He spent a year working with Joe Redington Sr, a legend in the world of huskies and dogsledding, creator of the popular Iditarod sled dog race. Lorenzo was Joe’s last handler, before he passed away in 1999. Shortly afterwards, Lorenzo returned home with 6 husky puppies, more determined than ever to bring his passion for dogsledding to Italy. 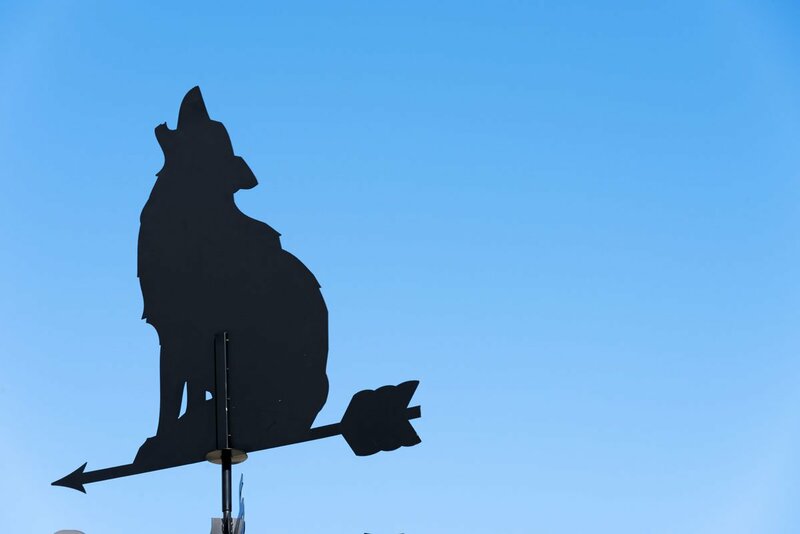 Husky Village was opened in 2002 and now houses 48 huskies, running tours all year round – with sleds in winter and wheeled carts in summer. 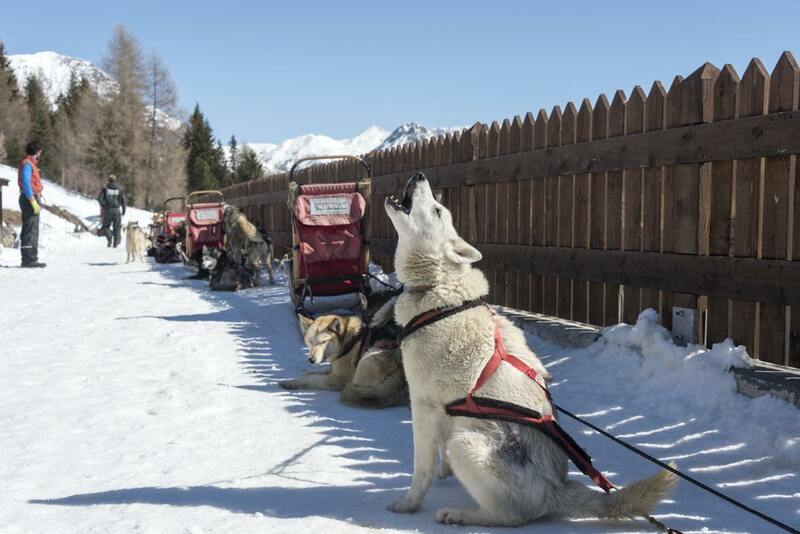 Dog sledding is the ideal experience to combine the love of nature with the love for animals, with a dash of adrenaline thrown in. 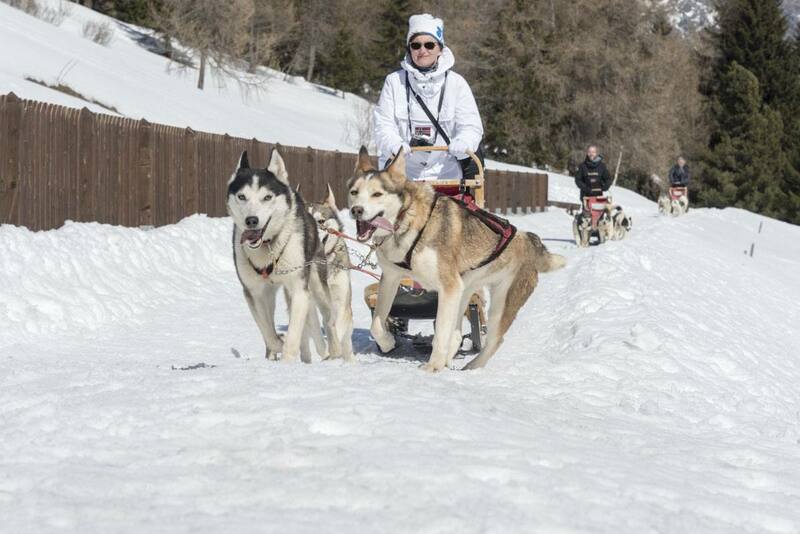 Provided that the animals are well looked after, dog sledding can be an ethical activity – most mushers love their dogs like their own children, and by having their dogs pull sleds they merely reinforce their natural instinct, pulling weights and running around in the snow. It wasn’t our first dogsledding experience – we had already been dogsledding the previous year in Lithuania, where we learnt and discussed in-depth the ethical implications of this discipline. Huskies love working. Their enthusiasm is contagious – they bark at their handler, as if to say ‘pick me! pick me!’- and when it’s time to go, there’s no stopping them. 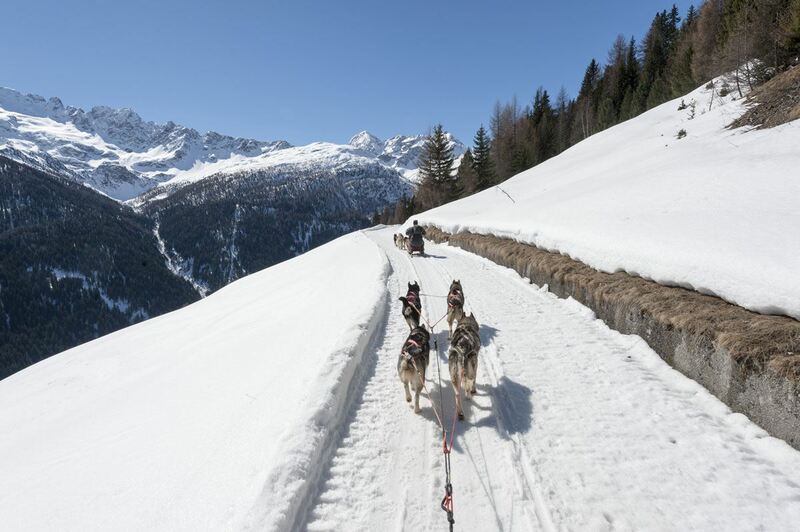 We were all given a sled and taught the three main commands for the dogs – HAAAAIK, meaning ‘go’, WOOOOAH, ‘stop’, and HOPHOPHOP, meaning ‘stop licking the snow/playing/checking out this amazing view’, it’s time to go. The trail wound around the mountain, with the forest and snowy incline on one side and the valley on the other. All sleds proceeded in single file. One moment the trail was narrow, with just enough room for the sled to turn – then it became wider and the valley opened up before us, the peaks standing out against the sky like sails onto the open sea. 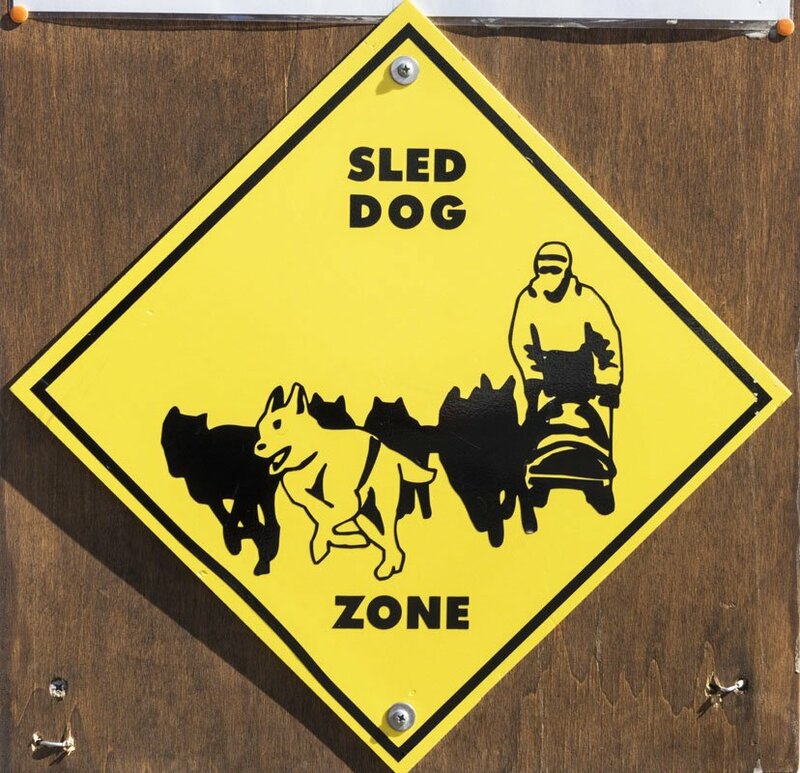 Driving a dog sled is straightforward. The dogs don’t usually need encouraging – running in the snow is what they love, and once the pack ahead of us took off, they followed. Once the pack ahead stopped, my dogs stopped too. It felt liberating – thrilling, but safe at the same time. The dogs moved fast, paws splashing on the almost-melted snow. The warmth of the first spring sun caressed my face, the mountain breeze ruffled my hair. I honestly didn’t know where to look. 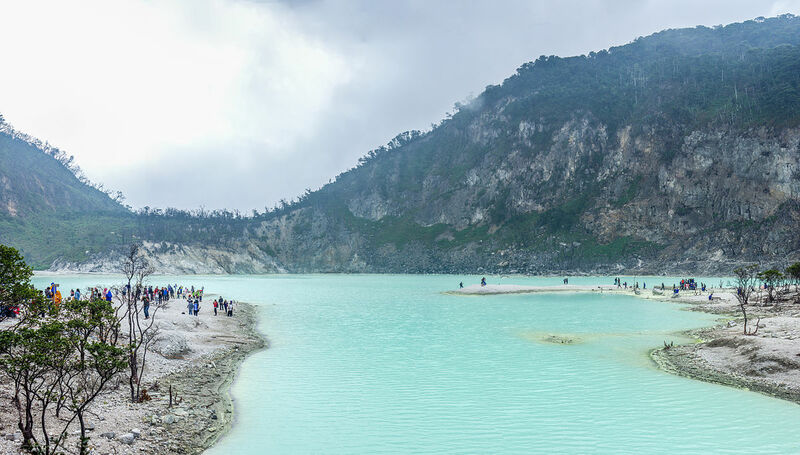 My gaze travelled fast, observing the spot where the white of the mountains met the blue of the sky, then looking at my four dogs, strong backs and paws moving simultaneously, ears pointed upwards and eyes forward. That moment was made of beauty. There was the happiness of the dogs, doing what they liked, what is in their nature. The sweet feeling of nature edging out of winter and into spring, from sleep to wakefulness, from death to rebirth. 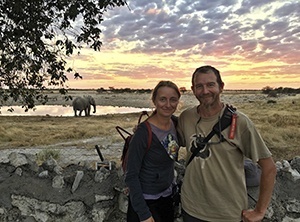 And my own happiness, being able to commune with two of the things I like most – animals and mountains. Yet, the day wasn’t over. After an hour, the dogsledding experience came to an end. 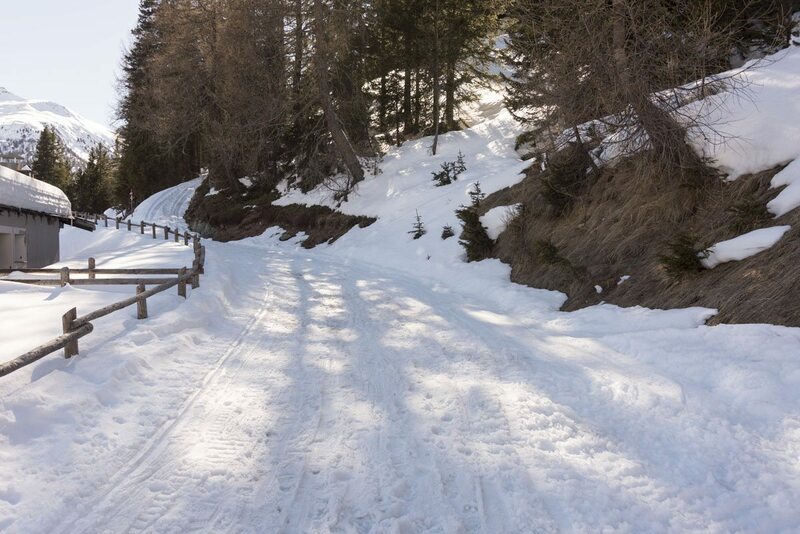 I wished we could have kept going for the whole afternoon, but we had another experience lined up – snowshoeing. 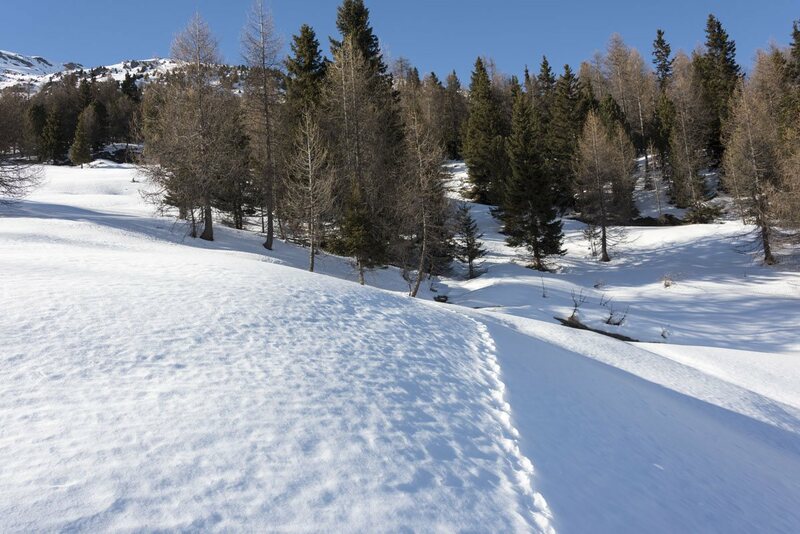 If you’ve never done it before, snowshoeing is tough, at first. Those chunky pieces of plastic strapped to your feet are heavy and you end up waddling rather than walking. 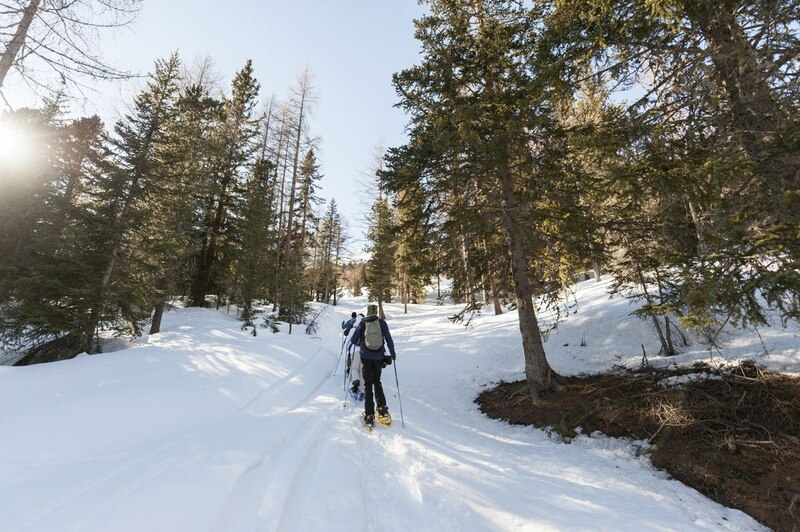 But once you get the hang of it, it’s easy to appreciate why snowshoeing is so much fun – because it allows you to get close to nature, to reach places that can otherwise only be reached with skis, to walk on soft, pristine snow. Doesn’t it make you want to run through the snow? We started walking up a trail through a forest. The light had lost its brightness of mid-afternoon, the sun had started its descent towards the mountains on the west. We walked up, between bare trees and animal trails – a hare here, a fox there – until we reached a clearing, with two ‘baite’, mountain houses, standing empty, their roofs stacked with snow. I ran onto the fresh snow, kicking it here and there, making snowballs and throwing snow in the air. We draw trails zigzagging left and right as we made our way up towards the highest of the two baite, where the view over the valley and the Lombardy Alps was at its best. Two half-dome mountains were right in front of us, one of their peaks covered by a massive glacier. I remembered the two times I ventured on glaciers – the adrenaline of being on a living, dynamic structure, the thrill (and fear) of when we crossed crevasses, all tied to one another, and I couldn’t help peeking below, to an abyss that seemed to have no end. A plane painted a straight white line onto the blue sky, like a streak of chalk on a freshly-cleaned blackboard. The line was thick at first, then it slowly got wider until it dissipated, absorbed by the blueness of the sky. We looked around, and the world had turned blue. The sun had set – the full moon had already appeared, ghostly and pale, rising above the peaks. It was blue hour, bearing witness to, the magical time when the two ladies of the sky take turns in shining across the heavens. We stood, and watched. Then we made our way down, back to the bottom of the valley. By Car: the only way to reach Arnoga directly from Milan is by car. It’s 224 km and it takes about 3 and a half hours. 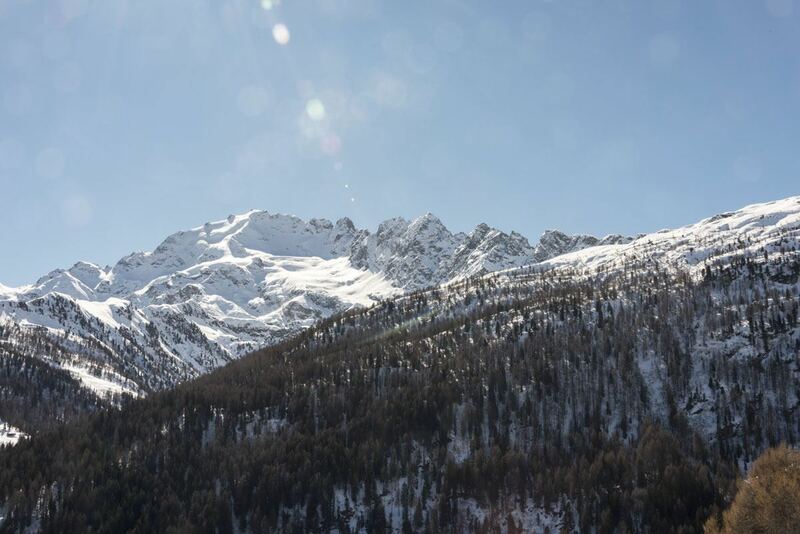 By Train: head to Tirano (2 and a half hours from Milan) and then take a taxi. 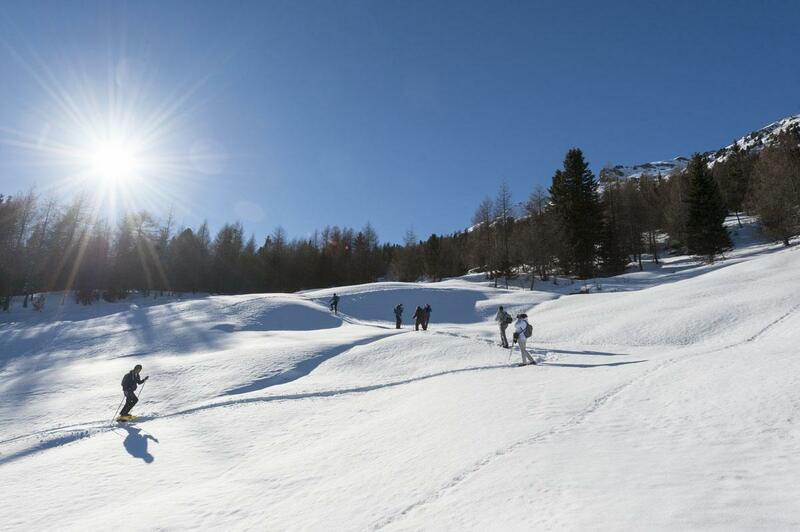 By Bus: there are buses between Milan and Bormio (3 hours) but they don’t run regularly. Then you’ll need a taxi. By Taxi: a reliable local operator is Germano Osmetti, based in Tirano. You can find his details here. There’s a lovely place to stay and eat right in Arnoga, the Hotel Li Arnoga, that also has an excellent restaurant serving some of the best pizzoccheri of my life. Surely though, night time action might be lacking up here. 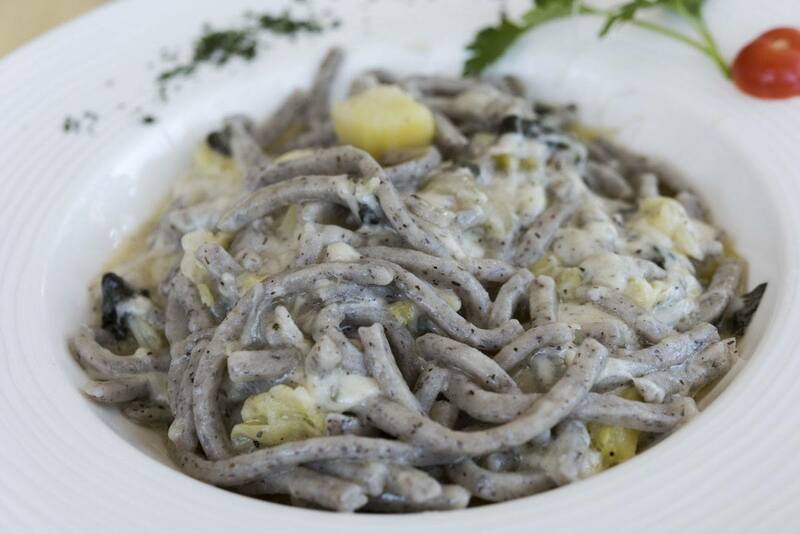 When in Valtellina… make sure you try Pizzoccheri! 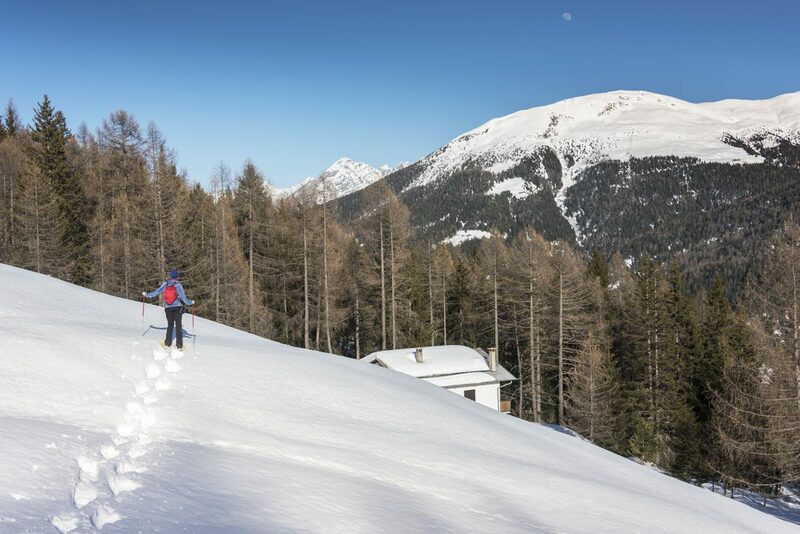 If you want to stay somewhere a bit more lively, opt for Bormio, a pretty mountain town a short drive away. We stayed at Hotel Stelvio, a comfortable three star property right in the centre of town. If you do end up visiting Bormio, make sure you visit the Braulio shop and grab a bottle of this iconic mountain liqueur made with herbs. ‘Braulio Riserva’ can only be found in Valtellina and it makes for a great gift – to yourself or to friends back home. 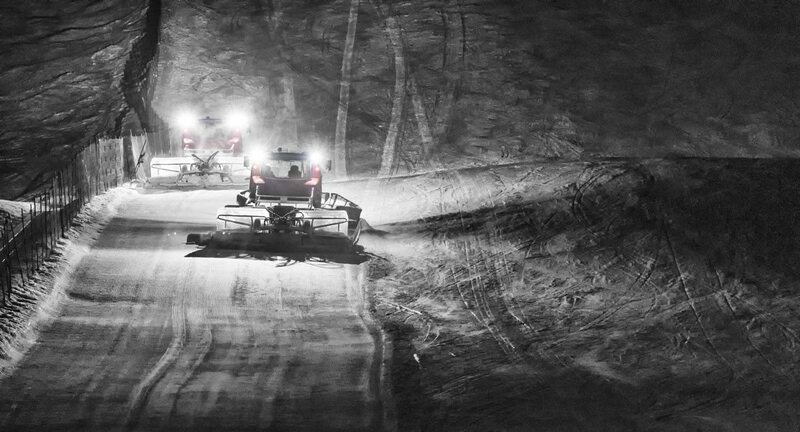 You can also ride in a snowcat if you want to have dinner at one of the slope restaurants – ask locally for info on how to arrange that! 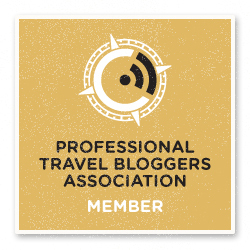 This post was brought to you as part of the #InLombardia365 campaign, in collaboration with In Lombardia and iambassador. 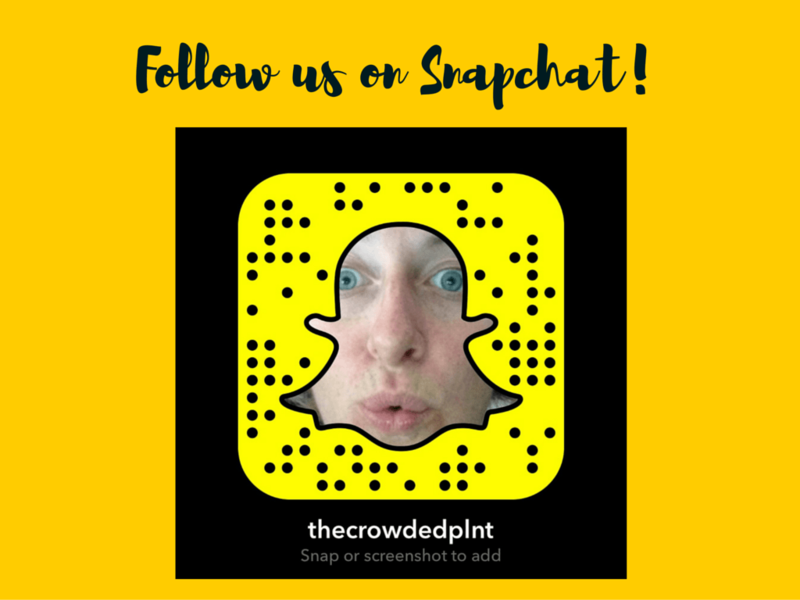 Snap the photo to add us!